IMPACT Exhibition Management Co., Ltd., is committed to support the youth; a future major force in the nation. IMPACT thus granted 5 awarded Scholarship for the amount of 1000 baht to selected students as the above pictures. In this event, Mrs.Sunee Churaisin,Ph,D Director, Bureau of Student development, Office of the Higher Education Commission is congratulated to those student as well as Khun Kiitwath, PR Assistant Manager at IMPACT. 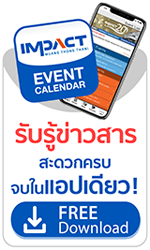 The event is held April 23 - April 24, 2557 at IMPACT Forum, Muang Thong Thani aims to promote the performance of the Office of Higher Education, exchange academic knowledge and also preparing all students and all walks of life for the opening of ASEAN.